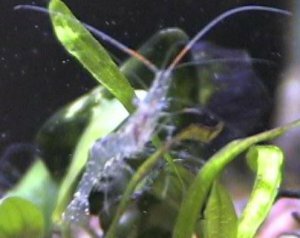 Here is Shrimpy, one of my ghost shrimp in my 40 gallon tank on 9/15/00. More photos can be found under ghost shrimp. See the algae-eating animals comparison table to see a comparison of the various algae-eating shrimp. There are many other freshwater shrimp species about which I know very little. If/when I learn more information about those, I will add them to this page. There are brief mentions of other species of shrimp under the link to Frank Greco's page. If you are interested in rare beautiful shrimp, check out his site. Return to the main crustacean page. See the master index for the crustacean pages.